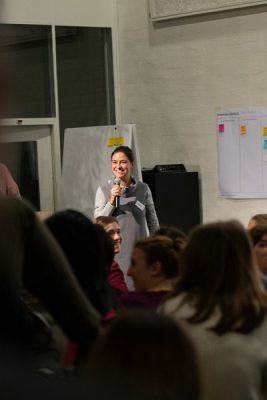 Following Impact Hub Basel’s popular Circular Economy event in September, November focused on the role of the circular economy in the consumer goods industry. The responsibility of, and collaboration between, producers and consumers to move towards sustainable consumption cycles is imperative, limiting waste, and the unnecessary use of natural resources. 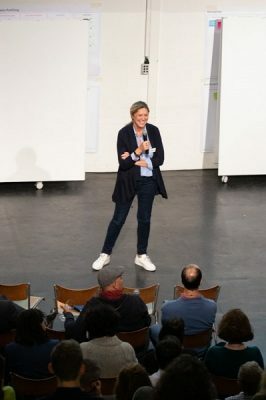 The “Consumer Goods in the Circular Economy” event started with an informational presentation from Dr. Pavlina Pavlova, Co-Lead for the Business Lab in Circular Economy at Impact Hub Zürich. The Circular Economy 2.0 model developed by Alexandre Lemille, a circular economy expert, was presented. Mitigating the long-term destructive nature of waste by maintaining and re-using as many of our products as possible was urged to become more of a priority. So maybe it’s time to consider doing something with the drawer full of old phones in your house. Oh wait, that might just be in my family. Incorporating natural and environmental fields with those of the current state of technology and society, made the theoretical circular economy model tangible and approachable. The model not only supports widespread involvement in sustainability, but also promotes job generation, and a higher quality of consumer products. And a few companies have already dedicated resources to making their business models more circular. For examples, Danone is looking to produce 100% circular packaging by 2025. Another reason yogurt is a far superior option to cornflakes in the morning. And because all Impact Hubs in Switzerland are circle-crazy, the Circular Economy Incubator program was launched. Chosen entrepreneurs and start-ups will work to accelerate the transition of Switzerland to a circular economy. The project has just started, and results will come out in Spring 2019. This has me so excited that I want to do many types of circular movement – twirl, cartwheel, hula hoop, go on a Ferris wheel. Our next speaker was Dorothée Schiesser from SapoCycle, a local non-profit start-up that repurposes used hotel soaps. Motivated to save the lives of the 1.5 million children who die every year from preventable hygiene problems, SapoCycle found a way to solve this issue and reduce waste. It collects, cleans, combines, molds, and transports child-sized soaps to aid organizations, for distribution in global regions of low hygiene, all within a circular model. Founded in 2014, SapoCycle’s business model looks to reduce the 150 tons of hotel soaps trashed, and redistribute the end result – similar to the sustainable role of the technospehere in the Circular Economy 2.0. Hearing about local effective social efforts, and entrepreneurs interested in moving towards circular business models, makes my heart spin. It doesn’t always pay to be clean though, so we all explored ideas for potential long-term financing options. Recommendations such as selling the refurbished soaps, offering membership fees for hotels, and franchising, were discussed. I’m looking forward to seeing how SapoCycle develops in the future, and if any of those sticky note suggestions led to some innovation. A big thank you to Dr. Pavlina Pavlova and Dorothée Schiesser for their insight! After the inspiring talks, we broke out into purposeful networking. I still haven’t found my soulmate–I mean, networking buddy! So if the combination of sports and nature makes you happy, and you wish all your consumer products were circular, hit me up. Meaningful conversation flowed into insightful apéro talk. I’m always astounded by the diversity of IH Basel’s events, and this one was no different – from quality control managers preparing to run community bio-orchards in France to sports teachers moonlighting as sustainable meat importers, there was never a dull moment. And in all that diversity, the unifying urgency of redesigning production and consumption cycles to be circular was present. Taking the example of the orchard enthusiast – is there a way to make the entire process surrounding this form of farming circular (not just the natural cycle of growing, picking, and replanting fruit trees)? What happens to “ugly” fruit, or leftover harvest? Does the impact of transporting and selling said fruit offset the benefit of fresh and organic produce? What are the labor, financial, and social needs to make the cycle circular? With this level of thought-provoking conversation, it’s no wonder most leave IH Basel’s event with a mix of hopeful optimism and a mind full of ideas to help solve the current pressing issues. And even if only one of these participants decides to start something based on these ideas, we’ve succeeded in fostering an environment to make the world a better (and more circular) place. Interested in finding some of your own circular economy networking buddies? Impact Hub Basel is the hip place to be in the Dreiländereck. Our Christmas Party event on December 4 will be both festive and mindful, and if you have a strong affinity for circles, let us know, and we’ll see what we can do.